I enjoy Dan Ariely’s work, partially because he writes well, partially because he can be wickedly funny, and partially because his findings are based on ingenious psychology experiments. I was delighted to find that he and Yael Melamede of SALTY Features launched a Kickstarter to produce a film on the subject. I backed it several weeks ago, and I am happy to say that as of now, it is a GO, at $126,154 out of $126,000 needed. They have liftoff! This is great news. 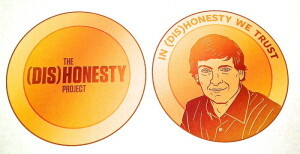 Dan’s book, “The (Honest) Truth About Dishonesty” was a fantastic, experimental science look at how how everybody, not just crooks, lie. It was a great look at how although many of us try to support an atmosphere of honesty, we’re probably doing it wrong. I am super happy to see this as a follow up to his work on cheating. Business is ultimately about human relationships. And the big Enron-type problems, as Dan documents in his book, generally start as small little bits of dishonesty that escalate, making it imperative to stop those at a small stage. Trouble is, human relationships always walk the brink between honesty, stupidity, and unkindness. In my recent post on “5 Ways To Do Cool Stuff At Your Dorky Job,” I dug into the honest, but stupid responses you might give to”does this dress make me look fat?” Trouble is, it just takes a lot more in the way of guts and a lot more brain power to tell a gentle truth (“why don’t you wear something else tonight?”) than an apparently easy-in-the-short-term lie. But even small lacks of honesty can quickly cascade into long-term harm. One of my favorite moments in Ariely’s first book, backed by a description of the experimental science, is when he explains altruistic cheating. This happens when someone is working on a team and cheats in order to cause others on the team to get a rewarded or avoid punishment. Altruistic cheating happens all the time when bosses can’t face difficult conversations, when they should be honest about an employee’s performance, but then, essentially lie because they don’t want to appear mean-spirited. “Sure, you’re doing fine.” It’s a lie, and one, when left uncorrected, will lead to bigger problems. The boss is lying to the employee, but internalizing a recognition of poor performance. By the time the boss reveals the poor performance, it will be at an explosion point and the employee will be shocked — because that employee has been lied to. If you’re interested in the Kickstarter incentives (like the “BiteCoin”), check the campaign out — it closes on Friday, May 9. I will almost guarantee you that the film will be fascinating for those of us who follow human relationships and what causes us to lie to one another — and ourselves.